Mentioned below is a list of top bench grinders that deliver flawless results and are popular with woodworking professionals. The motor delivers a reliable performance and produces low noise output. This bench grinder features two wheels that are ¾ inch thick and 8 inch diameter. One wheel is 36 grit for coarse grinding (deburr metal of ragged and chipped edges or protrusions, removing rust off metal surface etc.). The other is an 80 grit wheel for fine grinding (cleaning, polishing, buffing, sharpening etc.). Genesis GBG800L is a very cost effective bench grinder. Besides its industrial use, it is a great power tool to have at home for DIY projects. This bench grinder has two flexible work lights (one close to each grinding wheel) that adequately illuminate the work area for safety and better accuracy. A pair of clear eye shields protect your eyes and face from burns caused by friction sparks. Cast metal tool rests on this bench grinder are adjustable and comfortable to use. Genesis GBG800L features a cast iron base that reduces vibration of the unit during grinding sessions. Base of the unit has holes that are pre-drilled to facilitate easy mounting on a pedestal stand or a work bench to provide stability and to prevent walking or wobbling. The wheels catch up speed way too quickly. If you are not ready with the tool in correct position as soon as the motor starts running, there is a chance of causing damage to the tool. 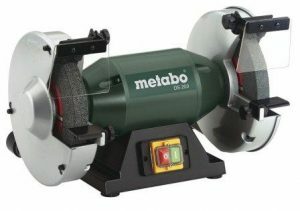 Metabo DS 200 is powered by a 4.8 Amp motor that has a low noise output. This motor turns the wheels at 3570 revolutions per minute (RPM). This bench grinder features two corundum grinding wheels. Both wheels are 1 inch thick and have an 8 inch diameter. One wheel is a 60 grit. It is used for fine grinding work, like cleaning, buffing, polishing, sharpening etc. The other wheel is 36 grit. It is used for coarse grinding work, like deburring metal and removal of rust off metal surface etc. Transparent eye shields on Metabo DS 200 protect from tool debris and sparks. Tool rests allow comfortable support to the work pieces. Eye guards are not large enough to offer adequate protection. Users say it is advisable to invest in a flip helmet that offers protection to the entire face. WEN 4276 is a high speed power tool. This bench grinder can easily deburr ragged and chipped edges or unwanted protrusions as well as remove rust from metal. It can also clean, buff and polish surfaces with effortless ease. Grinding jobs such as shaping, smoothening, sharpening etc. are quick and easy with this bench grinder. This bench grinder is powered by a 2.1 Amp motor. The motor has a low noise output and a smooth performance. This powerful motor turns the wheels at 3450 revolutions per minute (RPM). WEN 4276 bench grinder features two grinding wheels. Both wheels are ¾ inch thick and have a 6 inch diameter. One wheel is a 60 grit, and is meant for fine grinding tasks such as cleaning, buffing, polishing, sharpening etc. The other is a 36 grit wheel, and is meant for coarse grinding tasks such as deburring metal of ragged and chipped edges or protrusions, removal of rust off metal surface etc. WEN 4276 bench grinder features a powerful heavy duty motor. Given the durability and versatility of the grinding wheels, this bench grinder is ready to take on large volumes of work that are very common in production shops. It is ideal to have the work space well lit to ensure safety and precision. 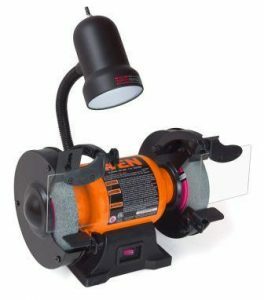 This bench grinder features a work light that will sufficiently illuminate your workspace. At 16 lb, WEN 4276 is light in weight and also of a compact size. This means, besides using it in your workshop, you can easily carry it with you on-site. 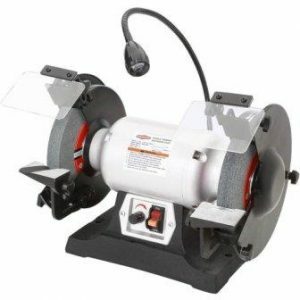 Adjustable eye shield on this bench grinder are vital to protect you from debris of the tools and friction sparks. Tool rests offer comfortable support and make way for accurate grinding. Light does not stay on unless the motor of the bench grinder is running. This causes inconvenience when you wish to examine the tool after grinding. Users have suggested that the work light should have an independent power on / off switch. Shop Fox W1840 is a variable speed grinder that is powered by a 3/4 HP motor. It also turns at 2000 – 3400 revolutions per minute (RPM). Slow speed offers better finesse. High speed helps faster removal of unwanted material. You can decide the speed you want to run the grinder at, depending on the grinding task you are using it for. Shop Fox W1840 features 2 grinding wheels of 8 inch diameter and are made of Aluminum-Oxide. When working with sharp tools, it is necessary that work areas must be well lit to ensure safety and precision. 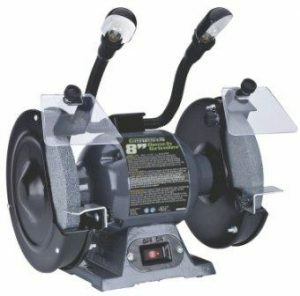 This bench grinder features a work light that will adequately illuminate your workspace. Eye shields on this bench grinder are large and transparent. They keep you safe from debris of the tools and friction sparks. Tool rests are comfortable to use and are adjustable. Base of this bench grinder is quite wide. Mounting the jig brackets so that they are centered with grinding wheel seems like an extremely inconvenient task.